Saturn V staging footage: S-II film recovery? Author Topic: Saturn V staging footage: S-II film recovery? The first sequence seems to be from the S-II looking aft toward the S-IC. You see the S-IC separate and fall and then the intertank skirt fall as well. Then in the second sequence it seems to be from the S-II looking forward towards the S-IVB. You can see the single J-2 ignite and there are three stabilzation(?) motors firing radially. How were these films recovered from the S-II stage? Any other comments about the staging sequences shown are appreciated. The cameras were housed in a container that jettisoned from the stages and were later picked up in the ocean. If you watch these clips of staging, you'll see the jettison at the end of each clip...as the camera unit started to separate from the stage. I had always read that the footage of the S-IV separation was actually from a Saturn IB launch and a number of accounts indicated that it was Apollo 7. The internal structure visible in the footage would tend to show that the footage is from a 1B launch was correct, though that does not confirm it as Apollo 7. Can anyone positively confirm? The footage of the S-IVB separation is one of the most commonly misidentified pieces of film from the Apollo program. It has been connected to several different flights, but there have been very few noted as the correct source. The footage is from AS-203, which flew on August 25, 1966. Here is the long form of the footage. If you watch at the end, it shows the separation of the film capsule, really neat! The Saturn IB version of the S-IVB had three ullage engines, while the Saturn V version of the S-IVB had only two. No ullage engines on the S-IVB 2xx series as the stage lacked restart capability (Saturn IB), while there were one each installed within the two 5xx series S-IVB APS pods (Saturn V). The 2xx series did have three ullage motors; vs two onboard the 5xx. Motors are normally the term of reference for solid propellant systems, engines are for liquid systems. The cameras were housed in a container that jettisoned from the staged and were later picked up in the ocean. All these years I had assumed these crisp clips came from a video downlink. I figured that the dropping stages burned-up on re-entry so how else would these videos be obtained? Are there any photos of these camera capsules or the recovery of them? Even with a parachute it must have been a chore to track and recover them? Am I correct that the spent stages burned up into nothing more than small pieces, as does the shuttle ET, or are there F1s and J2s sitting at the bottom of our oceans? The Saturn V's S-IC first stage with its five F-1 engines was jettisoned at an altitude of about 40 miles, while still in the Earth's atmosphere. It fell to the ocean mostly intact* and sank, although it certainly suffered damage on impact with the water. The S-II second stage with its five J-2 engines separated at an altitude of about 115 miles, well above the atmosphere. It too fell to the ocean about 2,500 miles downrange from the launch site but went through reentry forces and broke apart well before any parts impacted the water. *A small fragment (about a foot long) of the Saturn V S-IC that launched Apollo 11 fell onto the deck of a German ship in the Atlantic Ocean. Other pieces fell in the water near the ship. Are the exact whereabouts of them known and if so has anyone ever sent down a robotic submersible to photo/video any of these first stages? I concluded that the S-1C boosters from Apollo 8, 9, 10, 11, 13, and 16 landed in roughly a 5 x 11 nautical mile area. The biggest unknown was how the boosters were tracked. After checking some documentation, I believe they were not really tracked at all; I think they used estimated theoretical impact locations based on flight models. However, if the boosters were fitted with C or S band radar xponders, then the location would be fairly accurate. Granted, all of the boosters would have been reduced to wreckage with some large intact pieces, depending upon how they impacted the ocean. I would imagine they were tumbling during descent, as that seems to be what happens to these things once all the fuel is spent and they lose guidance. I imagine that many of the F-1 engine bells would have survived and at least some of them should be recognizable and capable of being recovered. Overall, the paint on the boosters should be intact as would be any lettering, as was the case on Liberty Bell 7. In addition, there will be long debris fields for each booster, with the heavier parts nearest the impact point and lighter wreckage farther down current. Thank you so much for this thread. I have always wondered what happened to the stages and am ready to help find them and bring them up! How cool would it be to see the first stages brought up? Since this thread's last post in 2011, Bezos Expeditions successfully raised components from the F-1 engines that launched Apollo 11, Apollo 12, Apollo 13 and Apollo 16. In the process, they discovered that most of the S-IC structure that supported the engines had corroded away and what remained was too fragile to recover off the ocean floor. See the discussion threads here and here for more. 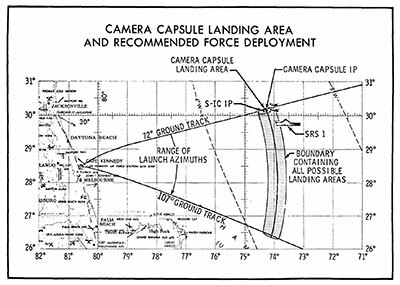 There was a total of four recoverable film camera capsules carried onboard the AS-503 vehicle, all on the S-IC stage. Two camera capsules were located on the S-IC forward interstage at positions I and III looking forward to view S-IC/S-II first plane separation and S-II engine start. The two remaining camera capsules were mounted on top of the S-IC stage LOX tank at positions II and IV, and contained pulse cameras which viewed aft into the LOX tank through fiber optics bundles. There were also two television cameras located in the S-IC base region to view propulsion and control system components. The TV cameras provided good quality data. Both television cameras will be mounted inside the thrust structure of the first stage. The TV cameras operate continuously from 55 minutes before liftoff until destroyed on first stage reentry. "I figured that it had to be a ship assigned to the Atlantic in case there was a launch abort. I couldn't find an answer anywhere, but a little sleuthing revealed that Task Force 140 was deployed in the Atlantic for each Apollo launch and that several smaller ships were assigned to the AS-501 launch, including the USS Austin (LPD-4), which was the only one big enough to accommodate a helicopter. Do we know who actually retrieved the pods? Is the USS Austin a good guess?" I am not aware of the answer to you question, however I seem to remember that on one of the launches that had the jetisonable staging cameras, some cameras were lost in a storm or hurricane. At least one camera was recovered weeks later after washing up on shore. True, but those were not the Apollo 4 cameras but those of the unmanned Saturn I flight SA-7, launched on September 18, 1964. Its camera pods were ejected directly into hurricane Gladys. Seven weeks later, two of the pods washed up, one on the island of San Salvador and the other on the island of Eleuthera. This NASA photo apparently shows the helicopter crew that recovered the Apollo 4 pods, seen on the deck in front of them. According to a 1970 command history submitted to the chief of naval operations, the USS Austin was indeed responsible for recovering the staging film. 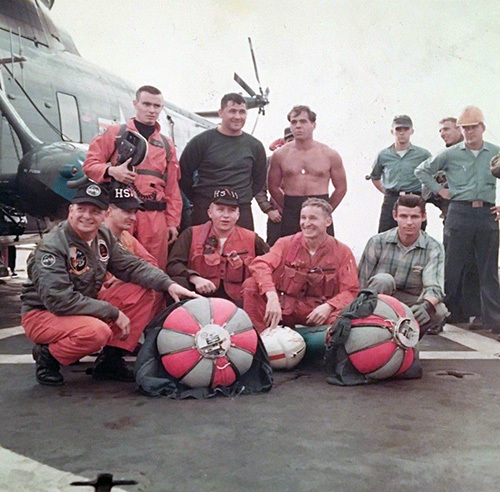 On 4 November 1967 AUSTIN, assisted by a detachment of Navy helicopters, members of Underwater Demolition Team 21, and NASA representatives became part of the recovery force for the Apollo 4 Space mission. The actual recovery of the spacecraft was, as planned, in another ship's assigned area; however, AUSTIN provided valuable service by recovering two camera cassettes carried by the first stage booster which had taken excellent pictures of the flight during liftoff and first stage flight. Excellent, thanks for confirming that Robert. This is great info. The picture is superb - It would be a great addition to an article about these cameras that I am finishing off. Are these photos copyrighted? Would love to use it. If anyone has a link to it, that would be great. Also, if anyone has any other great photos like this, or photos of the cameras that would be great. Where and when will your article be published? I'd be interested in reading it! Not sure yet but happy to send a draft... feedback always welcome, please send me an email. Here is a picture of the camera capsule predicted impact point, along with that of the S1C.